Adverts: Advertising is a form of communication for marketing and used to encourage, persuade, or manipulate an audience (viewers, readers or listeners; sometimes a specific group) to continue or take some new action. Most commonly, the desired result is to drive consumer behaviour with respect to a commercial offering, although political and ideological advertising is also common. 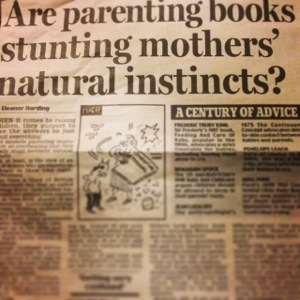 So, it is #rantyfriday and if you read my blog you know I often like a good rant, and sometimes that rant is about so called ‘parenting manuals!’ My dad once bought a manual to help him when I was a ‘difficult’ teenager. I don’t remember what it was called or exactly what was written in it but I do remember laughing out loud when I snuck into my parents bedroom to read it, thinking that the author clearly wasn’t a teenager as they didn’t get them at all! Maybe it was there that my dislike of parenting manuals began, who knows, but recently this irritation has spread to parenting adverts…. I was watching an advert for a popular squash brand this week and was infuriated by the tag line, ‘It’s great to be a dad, even better to be a friend.’ It is such a sweeping statement and I despair of parents who try and be their children’s friends; I’m of the firm opinion that you should be their parent! You, and they, probably have enough friends (I hope!) in your lives anyway. Parenting isn’t about being friends with your child, they are not supposed to like you, they are supposed to respect you and look up to you. Parenting is far more complex than friendship, and whilst I’m friendly with my children, I wouldn’t dream of actually being their friend. How would that help them? I’m supposed to discipline them, teach them the difference between right and wrong, nurture their talents and develop their personalities. I am not the one who should be having their first fag with them behind the bike sheds. Or be the first to hear about them losing their virginity. *shudders* I’m all for having a close,honest relationship with my children, but if they ask for my advice, the advice they will get is that from a mother, not a mate. After watching that advert I then got a bit obsessed with analysing others. Nappies for example; ‘All your baby needs to wake up happy is your love and a dry bottom.’ What a load of sodding rubbish! I love my baby endlessly, and he always has a nice, clean and dry bottom, but does he always wake up happy, does he heck! I, for that matter, am loved and always have a nice, clean and dry bottom and I wake up in a foul mood almost daily. And don’t even get me started on sanitary towels and, ‘Have a happy period.’ That was clearly written by a man. Why oh why would I or any other woman ever have a happy period? How could being bloated, tearful, irritated with everyone and everything, in pain, spotty and miserable as sin EVER be a happy experience. If a sanitary towel actually possessed magical powers and could make me have a happy period then I’d buy them in truck loads. Seriously, someone needs to invent that! In the article it says that 46% of Grandmothers listened to their own instincts. And the others shockingly took advice from Mothercare or Marks & Spencer. Can you imagine their advert, ‘This isn’t just any baby…this is a baby with the peachiest, smoothest skin. A baby whose cries sound like sweet music!’ Bleurch, you get the picture. Are these companies really that influential, do people actually listen to the words in their adverts? Are some men out there now changing their complete parenting style to be their son’s mates even though it could be going against every instinct they have? COULD NOT AGREE MORE. And now I think this not just about books, but hugely influential advertising as well. What do you think? 34 Comments on An Advert Rant. My baby isn’t hear yet (give him two months and he will be) so although I can’t write from personal experiences I couldn’t agree with you more, I remember when I was in school and there were girls who were going out to bars and stuff with their mums on a regular basis and I thought at the time it was wrong to be mates with your mum and so I hope when my little man is here I don’t take back everything I believe in and become desperate to be his friend because quite frankly I think it’s weird!!! Oh no… I loved the Squash advert. I do think you should be your child’s friend to some extent, but at the nd of the day you are the parent. The nappy advert made me swear a lot!!! Cameron has love and a dry bum, but will still wake up grumpy. I wonder if trading standards will tell them off for being inaccurate? If not, I shall just have to mock them….alot. Happy Period??? I have never known ANYONE to have a happy period. Yes you are right, clearly written by a man, and that man should be injected with female hormones and see how he bloody likes it! 87% of statistics are made up. I therefore hate every advert that uses statistics. And increasingly I am hating adverts full stop, too! I hate adverts so much I either leave the room, or record the programs I want to watch just to fast forward through them! Such a good idea, is it me or are there more adverts now than there ever were? They seem to be every 5 minutes in some programmes grrr! The one upside to the BBC, is no adverts. Most of them drive me bonkers, for one reason or another. There are some funny ones out there, but some are just mind meltingly annoying! I love reading parenting books but I feel a bit furtive about it, it’s a quick fix like eating chocolate, it makes me feel more in control at the time but once I come downoff the sugar high I feel worse than I did before. Yes, exactly that! They either give you a false sense of security or confirm what your instincts were telling you anyway! On the one hand they give you the reassurance you crave that these problems you’re going through CAN be solves, yet on the other hand they make you feel like a failure if you don’t manage to solve them. And on the third hand (because treacherous things like parenting books usually have three hands), they tell you that the only way to solve your problems is if you do exactly what they say. Make it a short one. A picture book in verse. 🙂 Heard anything back yet from the agent? Noooooo! But it can takes ages can’t it? I am not good at waiting, far too impatient! I totally agree, in fact when my children were little and I had upset them they would say ” Your not my friend anymore” I used to reply “No I am not your friend I am your Mum and that is why I have said no!” The adverts that really bug me are the yoghurt ones, like eating a yogurt will instantly change your life and appearance, also if I had friends over we wouldn’t be enjoying a yoghurt together, depending on the circumstances would either be Tea and Cake or Wine! On the Manual subject I read one and it was a serious one, that advised tying rope to your children’s door so that they cant get out, this was a hint on getting children to stay in bed! I havn’t read one since load of old tosh! Oh goodness yes I totally agree about the yoghurts, and you are so right there is no way I’d share one with my friends lol! And as for the manual with the rope idea….outrageous! Thank you for reading! Adverts influence my kids for sure, but I rarely get to watch TV so I’ve no idea what they are going on about! Lol! My middle child made me buy a Doggy Poo game for his birthday after he saw it on an advert….NEVER AGAIN!! Like Sara I rarely see adverts these days as we watch most things on Sky Plus so can fast forward. But I totally understand what you say and agree!